The resort is only a short drive from the Vilamoura's loverly beaches, shops, restaurants and night life. 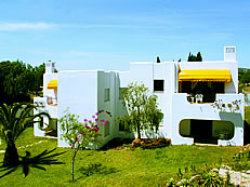 The apartments and villas encircle the landscaped gardens and for the serious sunbathers we offer a large swimming pool. Adjascent to teh pool is the children's play area. There is a pool side bar where drinks and snacks are served all day. Our bistro is open from breakfast through to dinner. If you like to play golf then that advantage or our exclusive golf rates on the 5 Vilamoura golf course and also Vila Sol golf course. 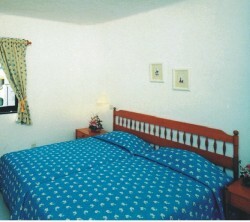 1 bedroom villas & apartments - sleep 2. The accommmodation has a twin bedroom, bathroom,kitchen, open plan lounge and dining area, leading onto an outisde terrace. 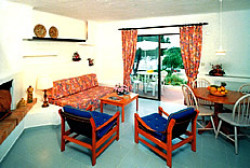 2 bedroom villas & apartments - sleeps 4. The accommodations has 2 twin bedrooms,bathroom,kitchen, open plan lounge and dining area, leading onto an outisde terrace. The villas are all ground level villas, while the apartments are in buidling of 4 apartments to each building.